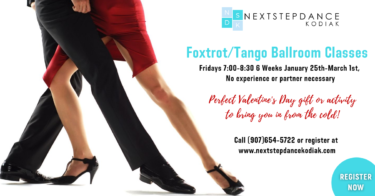 6 Week Foxtrot and Tango Class! Ready to beat the winter blues? Looking for that perfect Valentine’s Gift? Give us 6 weeks and have a great time learning the basics of foxtrot and tango! No experience or partner needed. Friday evenings, 7:00-8:30, $125 for six weeks. Call 907-654-5722 for more information, or Register online here! December 2018 newsletterSummer Camps are here!